We all know how the Norman Invasion of Ireland ended- not so good for the Irish. Join right in and watch our video with a combat reenactment! The medieval weapons of the Irish were no match to those of the Normans, and on this page we want to show you what that looked like exactly. Helping us on this page are the friendly Donegal folks at Eireann Edge. 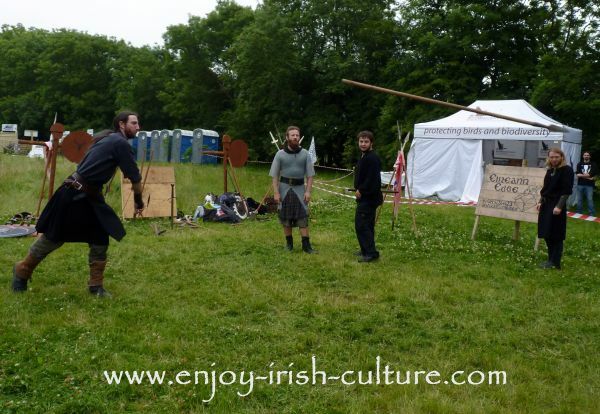 They have made it their mission in life to reconstruct the weapons of medieval Ireland and to reenact ancient battle scenes and combat. Fascinating stuff, and a very special part of Irish heritage. When stationed at Bagibun near Wexford waiting for the arrival of Richard de Clare (Strongbow), the pioneering group of Normans were attacked by both Viking and Irish forces attempting to fight them off. There are reports of these battles by contemporaries describing some of the Irish as running naked into battle and attempting to fight the knights without weapons, just hurling stones. The Normans in contrast had soldiers in different roles. They had horsemen and archers as well as people on foot. 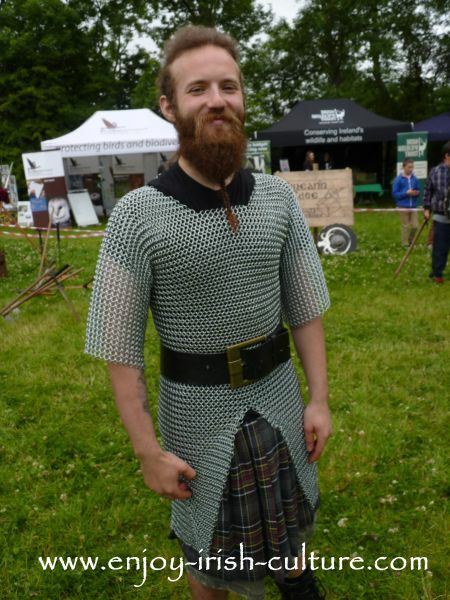 The Norman invasion of Ireland was led by individual knights in loose groups who were used to fighting alone, but they culd also work together very well.. Their body protection was chain mail or medieval armour. The Normans fought with bows and arrow, with spears, and with extra large, well made swords of superior steel. 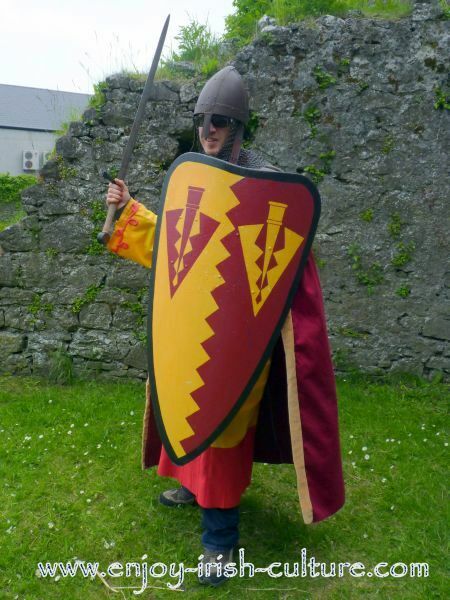 See Colm here, dressed up as a Norman knight on our recent visit to Athenry Heritage Centre. Note the extra large, sturdy metal shield. The Normans held their shield formations for as long as they could in battle, giving them extra protection. Norman knights were war machines. They had had military training and they came from a culture where doing military service for the king was a given. This experience combined with superior weaponry helped to guarantee their success in the Norman invasion of Ireland. The Irish were loyal to their own tribes that were frequently at conflict with each other. There was no central government, no high king powerful enough to pull their forces together. Although only some of them will have fought naked, their weapons were inferior. 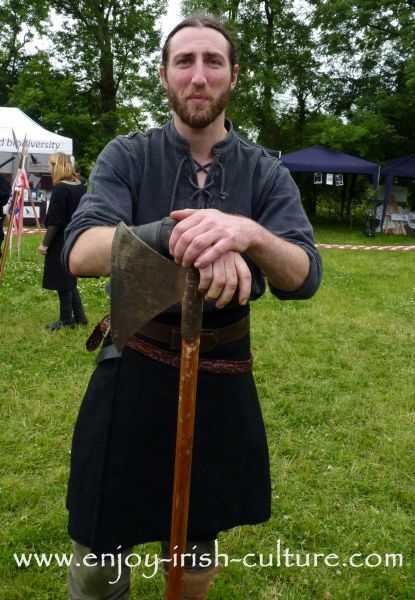 The Irish were used to fast ferocious fighting with short swords and wooden shields. They moved in quickly from a hiding place to surprise the enemy. Not wearing body protection made them faster, but when faced with Norman weapons, it also made them extremely vulnerable. Their initial shield formations would break up after a while when they fought individually. The shield was not only used for protection by the way. They were used to hit, push and shove the enemy in close contact. When an enemy's sword became lodged in a wooden shield, he was easily disarmed. 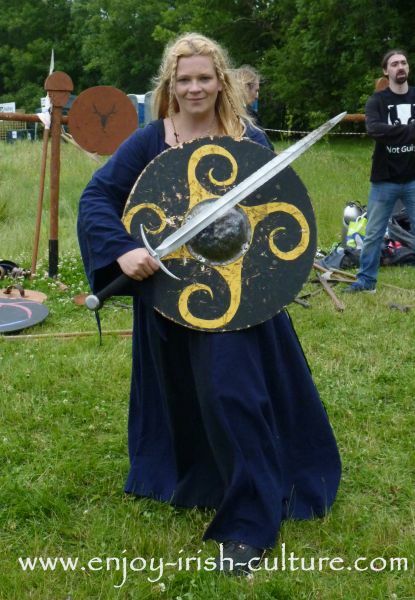 Clare from Eireann Edge demonstrates the small wooden shield with a metal centre used by the Irish, as well as a typical sword. And yes, the Irish did have female warriors. Charlie on the right is leaning on one of the battleaxes he made himself using traditional techniques. Battleaxes were the 'poor man's weapon', he says. When we watched him swinging it as it would have been used in battle, it sent shudders down our spine. Note the lack of armour! 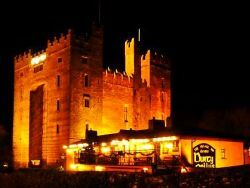 Read About The Anglo-Norman Tower House Castle, how to build one, how it was defended, how to attack one in medieval times, and come visit Irish castle ruins. 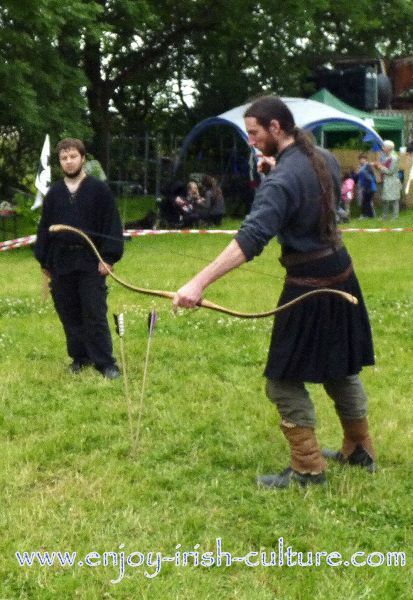 Charlie from Eireann Edge on the left demonstrating bow and arrow. The Irish had bows of the shape shown here, and a blacksmith made their arrow heads from iron. They could shoot around 25 arrows per minute, Charlie reckons. He is wearing a traditional kilt and leather shoes, and, again, no body protection. Jason on the right demonstrates chain mail, the only form of body protection known to the Irish introduced by the Vikings in the 9th century. Only few Irish warriors had chain mail, and not all Irish warriors wore helmets. It must have been a brutal affair altogether how the Normans tore through their ranks! However, on the last photo below, throwing a spear, Charlie leaves us in no doubt that the Irish were fierce warriors indeed. Although still inferior technologically, they would caused a lot of trouble for the Normans over the next couple of centuries to come.